With statistics like these, digital signage has secured its place in the world of AV. 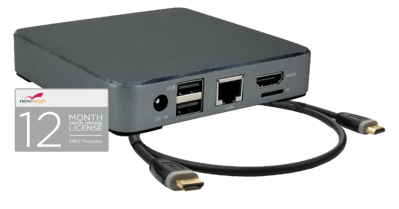 Liberty has positioned themselves to meet this new technology head-on by offering these in-demand integration options, while making them both easy to use and of excellent value, saving both time and money, while increasing revenue opportunities for the AV installer. To meet custom end-user requests, content creation resources will be available from Liberty and Novisign, further expanding on the digital signage services integrators will now be able to deliver to their end users with ease. The Novisign app license can be purchased separately, or a DigitaLinx digital signage player (Item Number DL-DMP-A) with the Novisign app already pre-installed can be paired with the licenses for easy system bundling- simply add a display! For unique vertical market needs and to deliver further cost and time savings, complete bundled system packages with hardware and licenses are available for a simple plug-and-play setup, delivering further cost and time savings. Add Liberty AV to your show stops at ISE 2019 (Booth K15-K227) or visit the Liberty AV Website to learn more about these Digital Media Services. Contact Liberty AV Solutions at 800-560-8998 or via orders@libav.com for more information.